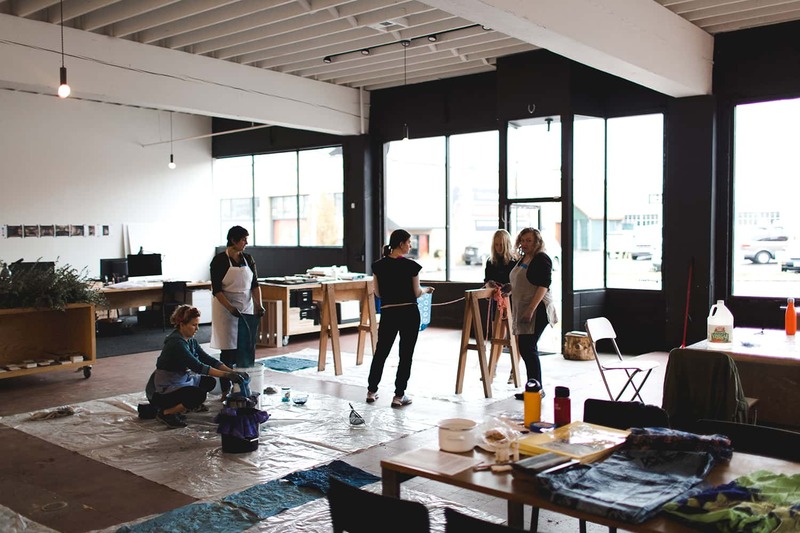 WildCraft West: our Portland OR studio opened in March 2016. This 3000 sq ft space is also the showroom & shop of Fieldwork Design & Architecture. WildCraft West offers 4-week evening courses and weekend workshops in contemporary craft skills, traditional textile practices and fresh perspectives on art-school classics. If you’d like to stop by the studio, please do so on weekends between 11am-3pm. Indigo enthusiast and textile artist, Britt Boles will guide students through the myriad of blue hues of indigo. In this workshop, herbalist Talia Hammond will guide us through the ins and outs of natural skincare and emulsions. Learn how to select an ideal wood for carving, how to use simple hand-carving tools to create a handsome and useful spoon. The practice of batik is one shared by cultures across the globe, from the Far East to Middle East, Central Asia to India. Learn to make a simple, functional, and handmade cutting board, cheese board, or tea tray straight from the tree. We’re celebrating the sweetest holiday of the year: Mother’s Day with a super special Mama & Child natural dye class! Participants will have hands-on experience processing minerals into pigments, as well as mixing them with various binders to make watercolor & oil paints. Weaver and textile artist, Kayla Powers, comes to us from Detroit, MI for this 3-day Natural Dye + Weaving intensive! In this 2-day workshop, students will learn, start to finish, a style of NW Native basket weaving, using Western Red Cedar bark & Coastal Sweetgrass Sedge. In this class, students will build a post-and-rung stool out of sustainably harvested Oregon White Oak. In this two-day intensive, students are guided through creating a reusable paper pattern and completing a garment from an existing item in their wardrobe. In this class, students will combine natural materials and local plants to weave around an abalone shell, using traditional Native weaving techniques. Swirling patterns, organic shapes and natural formations: marbling offers a playful, no-pressure approach to textile surface design. Learn to weaving an Adirondack pack-basket in this 2-day intensive. Students will use a combination of hand tools and power tools to build a folding stool frame out of sustainably harvested Oregon White Oak. Portland is in full bloom this time of year, and with a bright array of dye plants at our finger-tips.